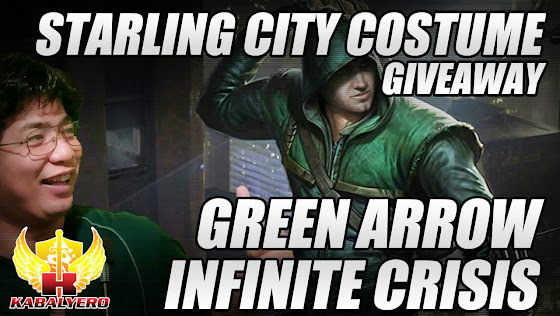 Green Arrow, Starling City Costume Giveaway, Infinite Crisis - KABALYERO - PLAY, BLOG & EARN! Green Arrow and his Starling City Costume is currently being given away in Infinite Crisis. Infinite Crisis is currently giving away Green Arrow and his Starling City Costume as part of a special television event involving the Flash and Arrow television series. To get your code for this give away, simply go to the official facebook page of Infinite Crisis and click on its corresponding link. After getting your code, you must redeem it in the official website of Infinite Crisis. Here is the link to the official website of Infinite Crisis, http://bit.ly/1gICgcH. So, you must get the code in the facebook page and you must redeem it in the website.